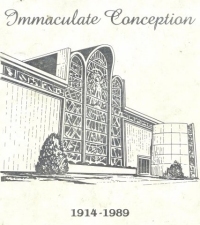 Immaculate Conception Church, located at 4400 S. California in Brighton Park, will hold a special mass commemorating the 100th anniversary of the church on April 5, 2014 at 2 p.m.
Parishioners, alumni who graduated from the parish school, priests and sisters who have been assigned to the parish are invited are invited to attend. A reception will follow in the parish gym. To RSVP, call the rectory at 773-523-1402. For more information on the Centennial celebration, please visit www.imcc-chicago.com.